Stock # 172935, 6.0L Vortec 1000 SFI V8 Engine, Automatic, 222791 mi. This Suburban can be purchased at anytime before close of auction and we offer speedy delivery. Give us a call to make this one yours today! 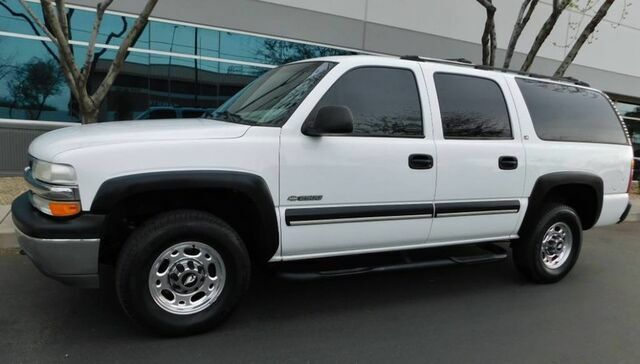 2000 Chevrolet Suburban 2500 4WD 3/4 Ton with 221,788 highway miles. This rig is loaded with all the right power options and is amazingly well preserved for it's age and miles. We just fully serviced this unit and everything works properly. This one starts, sounds, shifts and feels great. Drives extremely straight and true with ice cold A/C. Front end and suspension is perfectly tight and true. Not a rattle to be heard. If the odometer read 50k miles, you would believe it. That's how clean this one is all over!! CLEAN, NO ACCIDENT HISTORY, ARIZONA SINCE NEW CARFAX! The sides are extremely straight and the paint still shines with perfection. This is not a beat on, scratched up abused unit. One look it it's interior/exterior cleanliness and it quickly becomes obvious the one has always been cared for. This Suburban looks exactly as clean in person as the pictures show it to be. The interior is very clean and well kept with barely any signs of use. Never smoked in and zero signs of pets.The steering wheel leather is still perfect and the driver seat edge fabric isn't ripped. The exterior is beyond amazing for it's age and miles. No major dents or scratches. Only faults I can find are Expected rock chips have been touched up with the exact color on it's nose. Read our nearly 1,000 100% positive Ebay customer feedbacks! We have been selling on Ebay over 17 years and know what it takes to make a deal painless and we are a member of The Better Business Bureau with an A Rating. We are located minutes from Phoenix International Airport and will provide free ground transportation to our dealership. Please read the "Terms Of Sale" section. $299.95 Documentation Fee applies to all deals. Sales tax may apply.